I don’t know, maybe I’ll keep a list of DNF titles this year, just to see what factors make me set each aside. It turns out that right after Ambrose’s Elisha Barber story, I DNFed another title. What’s interesting, and the reason I bring it up, is how totally different this reading experience was from the other one. I mean, pretty often I DNF something because the writing just doesn’t grab me (or occasionally actually seems pretty bad). That wasn’t the case in either of these. 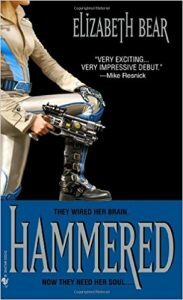 Okay, so, looking it up, I see that Hammered won the Locus Award for Best First Novel in 2006. Probably lots of you have read it. It was Elizabeth Bear’s debut and wow, you can totally see both the things about her writing that worked for me in the Range of Ghosts trilogy and the things that put me off. The good part: the world is complex and the characters are mostly complex as well. They are interesting and they all have tons of implied backstory and I could probably enjoy a book featuring almost any one of them. The bad part: this book doesn’t feature any one of them. It features all of them at once. I had trouble with that in the fantasy trilogy, but in that I was pulled along by lots of other features. The cool setting, for one, and the fascinating characters, and being able to spend a more extended period with each character before moving on to the next. In Hammered, the setting may be well-drawn, but a gritty near-ish future SF setting is just nowhere near as appealing to me as the world of Range of Ghosts. Also, we seem to spend no more than a handful of pages with any character before moving on, and whoa, there are a ton of pov characters, many of whom seem to have nothing to do with each other. Also, the reader is taken back and forth through time in a way that sometimes made it hard to tell what was happening in the contemporary story versus what had happened in the past. Each section is tagged with place and time, but I would forget what the tags said so I would wind up wondering if, say, the tidbit with the little girls was contemporary with the main story line or not. Jenny Casey looks like the main protagonist, if you had to pick one character to call the main protagonist. She’s a torn-up war vet with cybernetic prostheses. She’s friends with a gangster called Razorface, who I had trouble visualizing (wouldn’t you slice your mouth up if your teeth were razor-edged?). Also with a cop named Mitch. I kept wanting to stick with Jenny’s story, but kept being hauled out of it to focus on some other character’s pov. There’s an AI researcher named Elspeth who’s been in prison for some reason and has now been released for some reason. I sort of thought I might like her, but her sections were so short it was hard to tell. Also, you could sort of see how her plotline might connect up to Jenny’s eventually, but in the first quarter of the book they are so separate, it kind of felt strange to go from one to the other. Also, I kept forgetting to check when Elspeth’s sections were set, so I’m not sure whether the two plotlines were contemporaneous or not. Then there’s Valens, who I think might have been in the same military unit as Jenny at one point. He’s the Amoral Corporate Baddy Out For A Profit, I’m pretty sure. If so, that would make him the cliché of the novel. Maybe his character actually went a different direction; I’m not sure because I didn’t get that far. Then there are the two little girls, one of whom has either been sick or maybe was born with some kind of congenital condition, I couldn’t tell which. I have no idea how they were connected to anything and promptly forgot their names, and their father’s name, because they seemed so irrelevant. I’m sure it would all have come together eventually. And a guy named Richard Feynman. A physicist. (Really.) I don’t know how he connected with anything either. He had a scene in which he got to discuss virtual reality with a bartender. It seemed like every ten pages or so you’d hit another tight third-person pov for someone else. I guess I would have gotten into the story if I’d kept going, maybe, but . . . so many books, so little time. I just shut this one and went on to something else. What would have made this work for me: short chapters are supposed to give a story a faster-paced feel. I’m sure that’s true. And switching characters often might keep the reader more up-to-date with many different plotlines, I suppose. But I think if I’d been able to stick with one character for thirty pages at a time, it would have worked better for me. And maybe if the pov characters had been limited to three or so? Jenny and Elspeth would get my votes, just judging from the first 25% or so of the book. I would have been fine letting every other character be secondary. Also, tagged sections of backstory probably work for lots of readers, but in this case they didn’t really work well for me. No doubt most readers have no trouble remembering to read and pay attention to the tags, but for me, flashbacks worked into the present-day story line might have seemed more natural and made the jumps in time feel less like annoying interruptions to the flow of the story. In particular, I found myself wondering quite a bit about those two little girls and how they fit in, but it was too much trouble to flip back through the ebook and double check whether that short chapter was in the past or the present. A physical book would have made that a lot easier, of course, so this is more an ebook issue than an issue with the story as such. So, my second DNF in two days. I will add, today I finished a book I liked a lot, so I should be commenting on that in a day or so. Previous PostOut now! Next PostLet’s eat Grandma! Politics. When a group of fantasy characters out to slay a dragon stop to spend a few dozen chapters solving America’s political problems in conversations that are unrelated to the plot, that’s when I put the book down. Can these authors not write a political thriller set in the U.S? When the book is just a palanquin for the author’s politics the story always, always suffers. One book I read even began to address the reader, asking them to keep their world free from certain types of politicians before getting back to the gritty plot. It was weird. Adam, seriously? Like, the only time the author had the characters address the reader was in this instance? Really weird. In so many ways. It was really weird. The book isn’t written as if it’s a letter or something, so I have no idea how the protagonist knew it was a book someone could read. But since telling people how to vote is more important than writing a good story, the author decided to stomp through the fourth wall like the Kool-Aid Man. I had similar feelings about Bear’s Dust. It didn’t have quite so many POV characters, but it was so mind-bendingly complex and multi-layered and allusive that I had no idea what was going on most of the time, and it was hard to sympathize with the characters when I couldn’t for the life of me figure out what they were trying to do. I did finish it, hoping that I would finally understand something by the end, and I sort of did, but it was way too much work for me to want to go on to the sequel. But I loved Range of Ghosts, and Karen Memory was a hoot. She’s a brilliant writer. I think I’m just not a brilliant enough reader to get all of her work.